While preparing for a presentation on book illustrations this summer, we came across a rare volume of prints in our Rare Book collection that has special historical significance today (October 15). 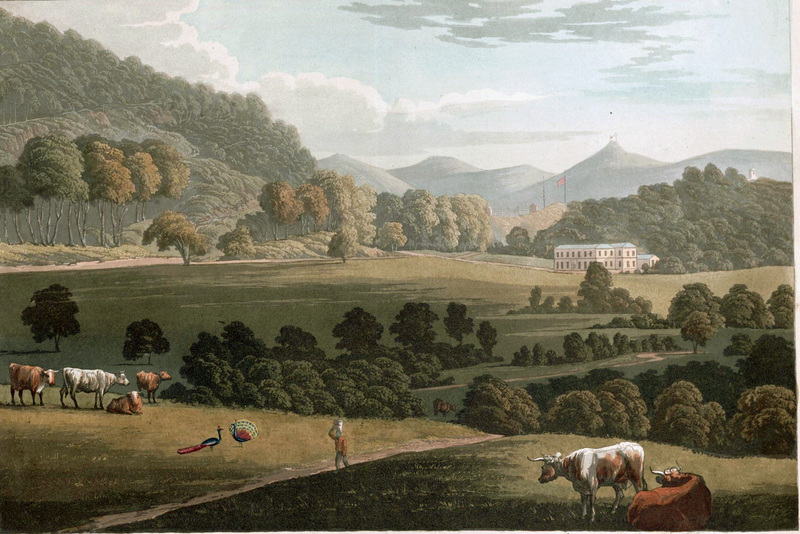 George Hutchins Bellasis’s Views of Saint Helena (London: printed by John Tyler, 1815) contains six hand-colored aquatint landscapes, each measuring approximately 9 inches by 14.5 inches, of the island that became the final home of the deposed emperor Napoleon. 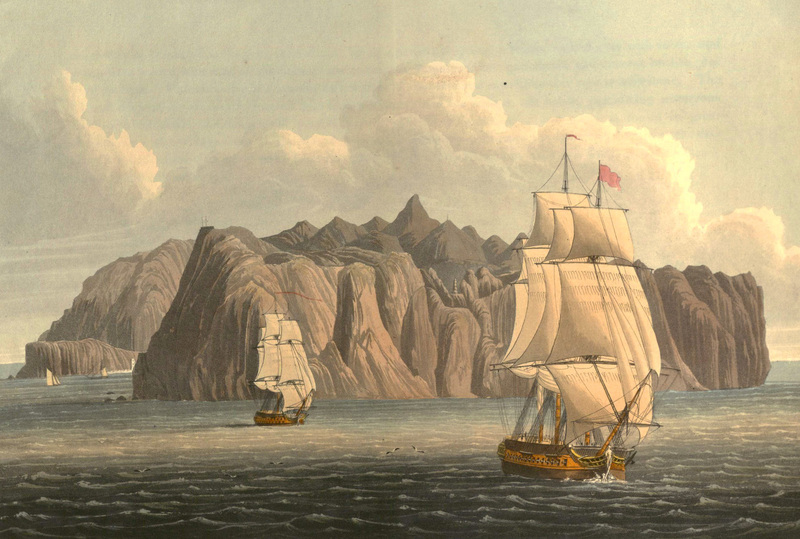 He would spend the last six years of his life in exile on Saint Helena. St. Helena, taken from sea. Napoleon stepped ashore on Saint Helena on October 15, 1815. It was the final act of a long drama that had turned Europe upside down, as Napoleon built and defended an empire against a series of coalitions led by Great Britain. Once before, in 1814, Napoleon had been defeated and captured, only to escape exile on the Mediterranean island of Elba in 1815. His final defeat at Waterloo in June 1815 led to the determination of his British captors to imprison the emperor in a place where escape was virtually impossible. They chose well: Saint Helena was, and remains, one of the most remote inhabited places on earth. Located about 1,200 miles west of Africa and 1,800 miles east of South America, Saint Helena is still a British territory, with a current population of about 7,750. Thanks to an eight-month visit to Saint Helena by soldier and artist George H. Bellasis, a certain segment of the British population soon got to see what the newly-famous island looked like. Bellasis, a young officer in the 19th Light Dragoons of the British East India Company, had been put ashore on Saint Helena in 1804 when he became too sick to continue his voyage home from India. While he recuperated, Bellasis made sketches of the dramatic island landscape. Eleven years later, when the location of Napoleon’s new home was disclosed, Bellasis arranged to have six of his sketches etched and printed in Views of Saint Helena. Artist Robert Havell used the aquatint process to make the prints, giving the illustrations a rich texture. Each of the prints was then hand-colored. Plantation House, the country residence of the Governor. Bellasis obtained 263 subscribers for Views of Saint Helena (including Queen Charlotte and other members of the royal family), suggesting that at least this many copies were printed, though only 31 are currently listed in the bibliographic database Worldcat. He dedicated the book to Arthur Wellesley, Duke of Wellington, Napoleon’s recent nemesis on the battlefield, who, in 1804, had been colonel of the 19th Light Dragoons in India. The provenance of UVM’s copy of Views of Saint Helena is unknown. This entry was posted in Rare Books and tagged aquatints, George H. Bellasis, Napoleon, Saint Helena. Bookmark the permalink.